I attained enlightenment in County Antrim, Northern Ireland. Not the lights-flashing, God-appearing, Hallelujah! type of enlightenment, but rather a far-more-subtle, restorative, all’s-right-with-the-world kind. 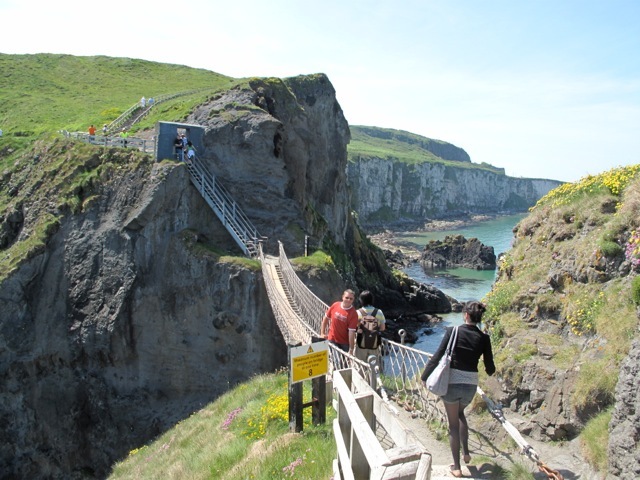 This enlightenment hit me not while clambering over the Giants Causeway, not while swigging a dram of whiskey at Bushmills, nor while white-knuckling my way across the tightrope known as the Carrick-A-Reed rope bridge. No, I found it in forested glens, along cascading waterfalls, on windswept headlands, and on a remote island. Not that I came to Northern Ireland looking for enlightenment or even spiritual renewal. I came, along with my husband and father, to noodle the highways and byways, explore the castles and ruins, and soak up the Irish craic or good times along with a pint of Smitty’s or Guinness. 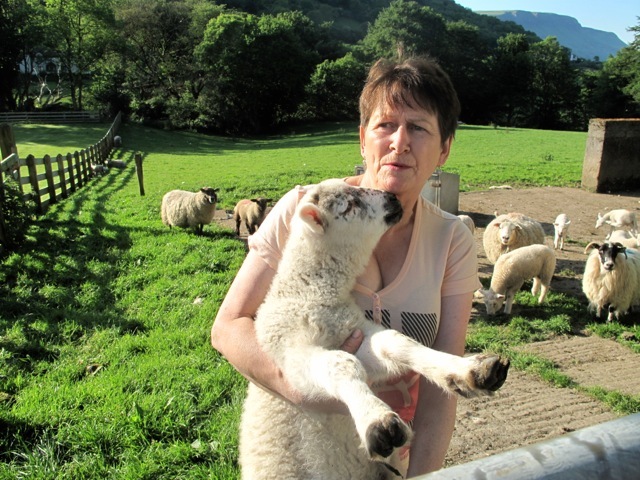 Sure, I had a laundry list of must-sees and must-dos, but as soon as I arrived in the Glens of Antrim, I tossed it aside and let serendipity rule. 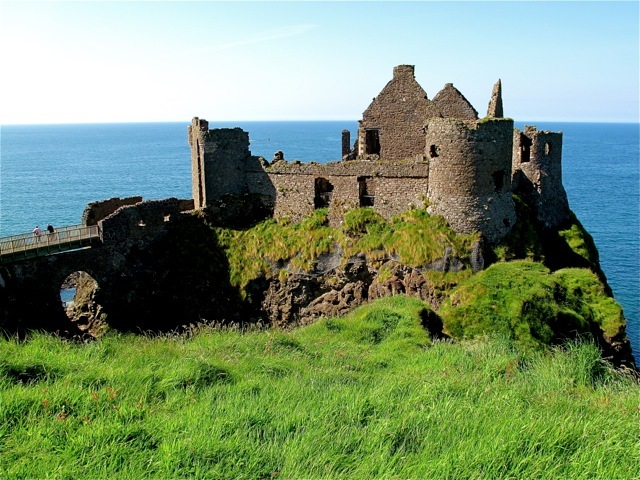 Legend and lore permeate the Glens, glacier-sculpted valleys of woodlands and grasslands, peatbogs and beaches, cliff-edged mountains and rock-bound headlands that stretch along 50 miles of County Antrim’s coastline. Wee fairy folk allegedly reside in woodland caves and coastal crags. Rural byways are peppered with ancient ruins and historic sites. Listen closely, and it’s almost possible to imagine hearing long-ago battles amidst the peaceful quiet disrupted only by bleating sheep and bellowing cows. Tea is what drew me to Glenarm Castle, in Glenarm, one of Northern Ireland’s oldest estates. It’s been home to the McDonnell family, Earls of Antrim, since the 17th century. The castle isn’t regularly open to the public (only on select dates), but the tearoom and the walled garden are. 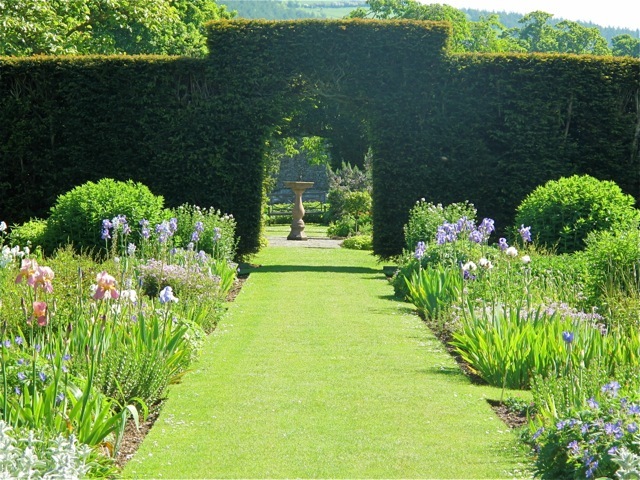 We detoured off the main road for tea and scones, but couldn’t resist exploring the garden, which dates the 18th century. The bright colors of blossoming spring bulbs and fruit trees appeared as if fairy folk had engaged in a paintball match. Continuing north, the splendidly scenic Antrim Coast Road squeezes through the Red Arch, a landmark tunnel through a headland cut in 1817, before arriving in Glenariff, Queen of the Glens. It would be hard to imagine a finer place to absorb this queen’s beauty than Dieskirt Farm Bed and Breakfast, James and Ann McHenry’s 350-acre working sheep farm. Dieskirt Farms sits high in the glen, offering glimpses of the distant sea over sheep-manicured lawns dotted with lambs and a corralled horse and donkeys. I grew to love this simple place, with its generous breakfasts and congenial hosts. 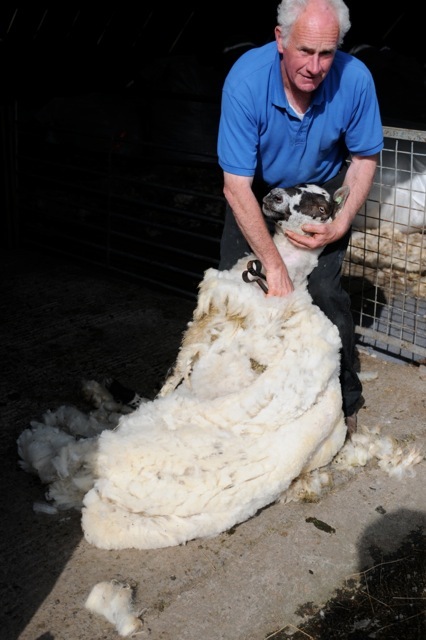 James even invited us to watch him hand shear a sheep. Out the B&B’s backdoor, Glenariff Forest Park beckoned. 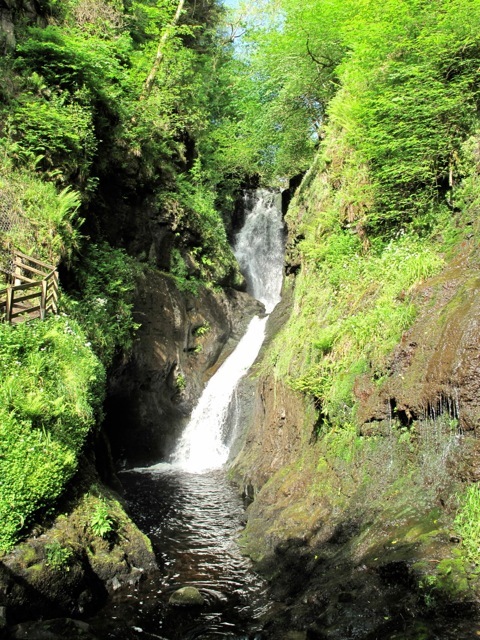 The Glenariff and Inver rivers tumble through dense, century-old oak, ash, willow, and hazel trees in this waterfall-rich woodland. Light filtered through the canopy, dancing off the rushing waters and illuminating pools as I moseyed along. Trails edge the flows, crossing bridges over gurgling stepped falls and passing though mossy-walled gorges, where plunging cascades mist the air with the damp, strangely life-affirming scent of winter decay blended with spring renewal. We walked and wandered, hoofed up Glenariff Mountain, and refueled each evening at Laragh Lodge, a comfortable restaurant tucked in the crag at the head of the glen. While the glens whisper their appeal, the coast shouts, with iconic sights that demand attention, such as the Carrick-A-Rede Rope Bridge. Originally used by salmon fishermen to access their nets, the rope-and-slat bridge spans a 66-feet-wide, 75-feet-deep chasm separating Carrick Island from the mainland. Crossing the bridge isn’t for the faint of heart or the fearful of heights, but even so, there’s nearly always a line, in part because almost everyone stops midway across for photos. Since no one regulates the one-way flow, you can wait a while before the tide of human foot traffic reverses its flow. Touristy, yes, but I enjoyed the wobbly, fun-house-like crossing and my brief wander around the island. Wish I could be equally enthusiastic about the Giant’s Causeway. Every guidebook, brochure, and magazine highlighting this region points to this icon as a must see attraction. The name is appropriate name, given this causeway of polygonal basalt columns truly appears as if placed for a giant to happen along and climb up and out of the frigid blue seas that lap aggressively at their base. Legend has it that Irish giant Finn McCool built it so he could walk across the sea to battle Scottish giant Benandonnier. 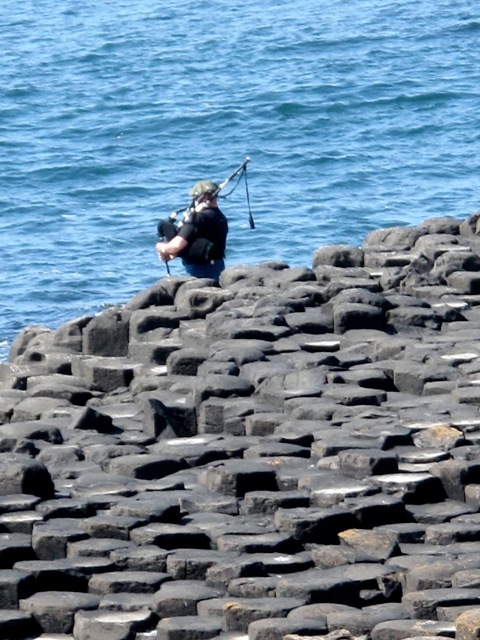 Now a UNESCO World Heritage Site maintained by the National Trust, the Giant’s Causeway is being loved to death. Maybe years ago, before the hype and the tour buses, before the visitor center and the endless parking lots, maybe then this was a marvel to stumble upon. We found it extremely crowded, and the only thing that broke through the commercial chatter was spying a lone bagpiper playing out on a point. This was, without question, the low point of our Antrim Coast visit. I suspect that had we visited first thing in the morning or had the time to hike the two-mile Runkerry Head trail, we might have had a better experience. We could have drowned our experiences in Bushmills, which has been distilling whiskey for more than 400 years. Instead, we opted to drink in the views from Dunlace Castle, a spectacularly romantic ruin topping a cliff just west of town. Although there’s evidence that the castle dates back to the 14th century, the existing drawbridge-accessed ruins are late medieval and 17th-century constructions. No matter, this castle is a stunner that becomes all-the-more impressive when prowling around inside and realizing the immensity of it. 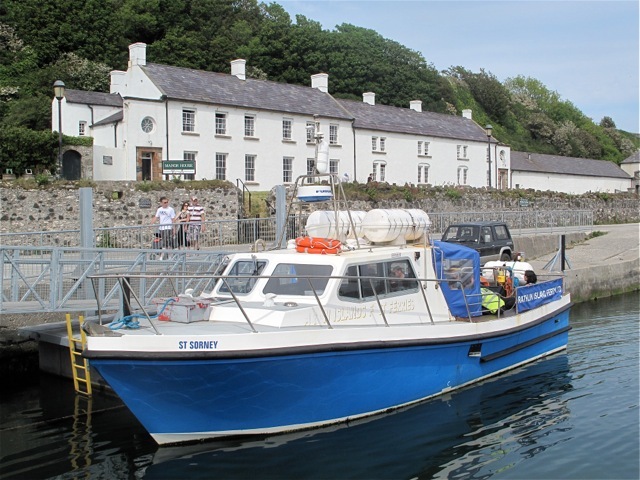 My penchant for going off the beaten track demanded we visit Rathlin Island, Northern Ireland’s mostly northerly outpost. I’d first heard Rathin’s Siren song when we’d taken a spin out to Torr Head, a smashingly scenic headland with views to both Rathlin and Scotland’s Mull of Kintyre. Way back in 1306, Robert the Bruce took refuge on Rathlin, when driven from Scotland by England’s Edward I. Legend has it that, inspired by watching a spider succeed after trying repeatedly try to bridge a hole in its web, he gathered new forces and returned home to fight for his kingdom. 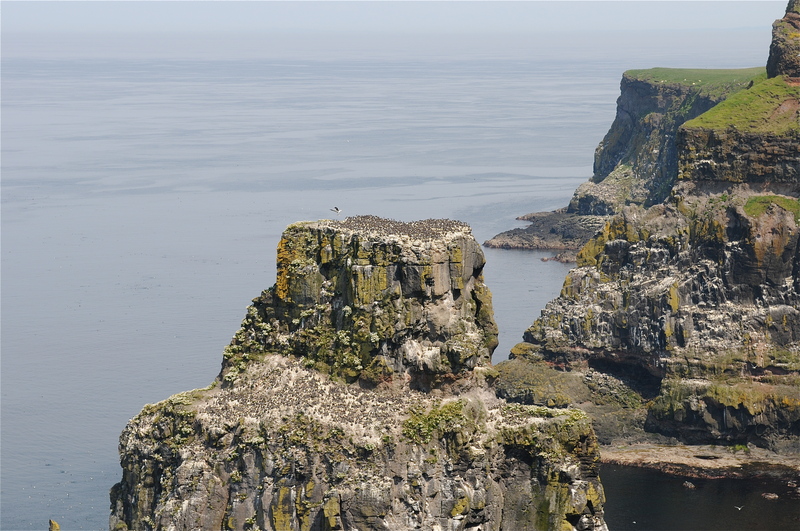 These days, Rathlin is best known as the site of Northern Ireland’s biggest seabird colony, with a center maintained by the Royal Society for the Protection of Birds. Getting to it requires ferrying 6 miles across the Sea of Moyle from the market town of Ballycastle. The Puffin Bus meets the ferry, carrying those who don’t have the time or inclination to walk the 4 miles to the center, based at an upside-down lighthouse on the island’s western tip. 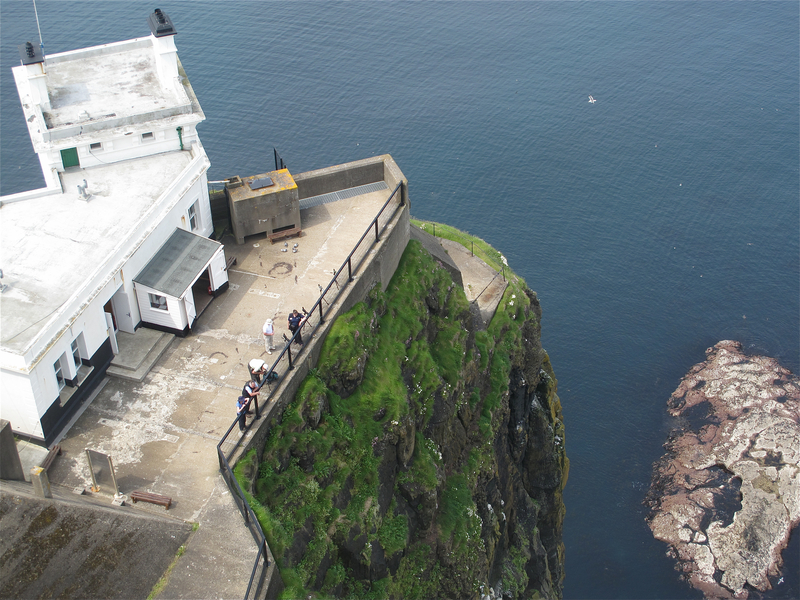 The one-lane road snakes over the mostly tree-barren island, soaring to heights with head-swiveling views, descending to valleys, and eventually arriving at a lofty headland, from which a marked path zigzagged down toward the lighthouse, before giving way to 89 (count ’em) steps to the viewing deck. The cacophony of bird cries fills the air, as tens of thousands of seabirds—fulmars, guillemots, kittiwakes, puffins, and razorbill—perform avian antics, flitting, fishing, and nesting around the cliffs and stacks. When we finally departed, I promised myself I’d return, book a room at the Manor House, an 18th-century Georgian-style inn on the harbor, and spend a few days hiking the trails. I want to immerse myself in this wild and remote paradise that gifted me with a lightened sense of renewal as clear and as pure as the ocean-cleansed air. Northern Ireland uses British sterling (GBP) as its currency. Tags: Antrim, county antrim northern ireland, Glenarm, glens of ariff. Bookmark the permalink.